Pretzel Logic's Market Charts and Analysis: INDU Update: Better "Nate than Lever"
INDU Update: Better "Nate than Lever"
Last update noted that INDU was incredibly overbought and suggested that a correction might be near, but I was leaning toward one more new high for the near-term. The market instead reversed directly -- after going out on the high of the previous day, which is very unusual behavior to say the least (when the market goes out on the day's high or low, that level is almost always broken soon after, and not the "final" high or low prior to a reversal). It's unclear whether the all-time high is an ending diagonal terminal pattern, or a b-wave. If it's a b-wave, then the decline will be impulsive (five waves) but instead of beginning the correction, it will end the correction. I'm leaning toward the ATH as an ending diagonal, meaning the current correction should have at least two legs (red ABC). 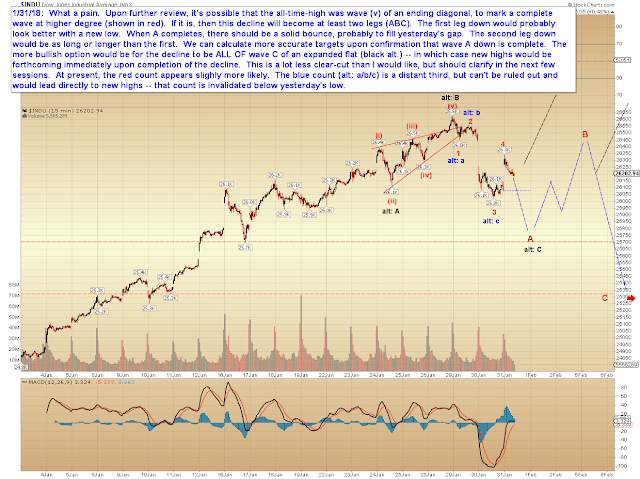 INDU already has three waves down, which could mark a (smaller) complete abc at yesterday's low. This is my least favored option, but it's technically possible. Presuming my preferred count is correct, we have not yet seen the end of the first leg down. If wave A hasn't ended yet, obviously it's much harder to calculate where the B wave will bounce to, and where the (presumed) subsequent C-wave will decline to, prior to seeing the end of even this first leg down. Understand that blue wave A could stretch lower, or end higher, than shown -- which could of course alter the positions of both wave B and wave C.
In conclusion, the first step for bears is to break yesterday's low, which would give them an impulsive decline. 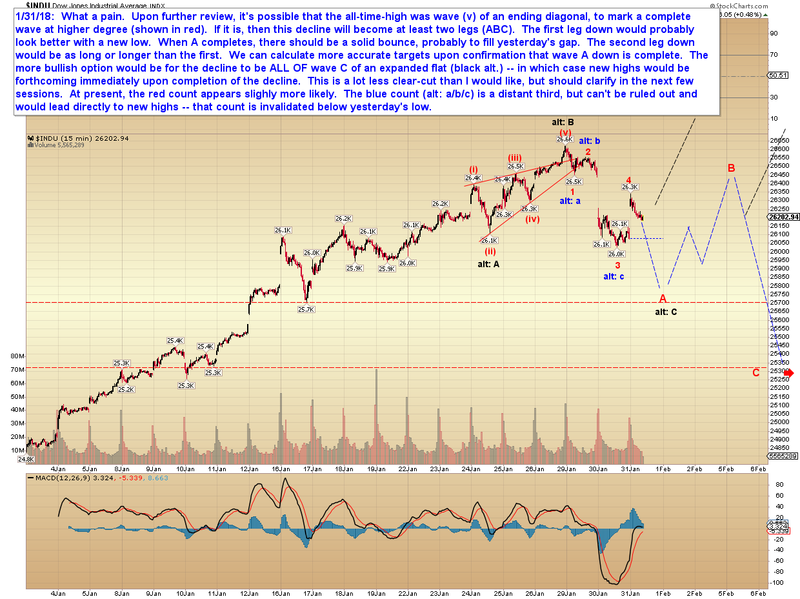 From there, assuming the ending diagonal interpretation is correct, we should see a bounce in wave B, which would then lead to another leg down in wave C. If bulls instead turn the current rally into an impulse, then we'll have to at least consider the blue abc count -- sustained trade above today's high could be a warning for bears. The x-factor remains the potential that the all-time high is a b-wave, which is technically possible, though seems less likely. Probably the key point to absorb from all this, though, is is the first time in months that we've seen a correction that looks like it may develop some meat to it. Trade safe. p.s. -- If you don't know the joke about Nate the snake (the reference in the article title), you might consider yourself fortunate... I heard this joke as a teenager from a friend's dad, and I have been cursed with it ever since. If you just have to know the joke, I found it posted on a random internet forum. Don't say I didn't warn you!